The wolves, cougars, coyotes, and raccoons of British Columbia (BC) have got a price on their heads. 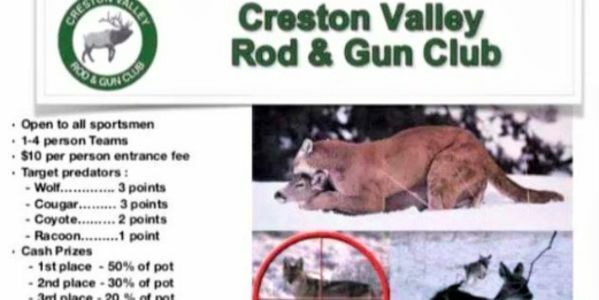 At the "Predator Tournament," sponsored by the Creston Valley Rod & Gun Club, if you bag a raccoon, you get one point; two points for a coyote; and for a cougar or wolf, you get a whopping 3 points. The person who kills the most animals and gets the most points takes home a hefty sum of money. Unfortunately, this is just one of three animal contests that are in the works in B.C. Hundreds of animals, including apex predators like the cougar and wolf, will be slaughtered for no reason other than the fact that they could win one "lucky" hunter some money. These animals play a prominent role in the ecosystem and shouldn't be used as target practice to boost someone's ego. Traditionally, man hunted out of necessity. The animals they killed provided their entire village with sustenance that would help them survive the winter, provide them with skins for clothes and bones for tools. In the past, those who needed to hunt would use every piece of the animal and even give it gratitude for their sacrifice. That noble idea of hunting has long gone, and in many places, have been replaced with vulgar hunting contests in which the goal isn't to kill an animal for survival, but rather for prize money and rewards. The province's Minister of Forests, Lands, Natural Resource Operations, and Rural Development (FLNRO) says he doesn't "condone" these types of hunts but provided that "the hunters are properly licensed and all laws are followed" these contests are completely legal. That needs to change. Please sign the petition and demand that FLNRO Minister Doug Donaldson and others take steps to ban these types of contests today.